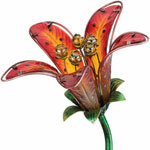 A yard full of flowers is a gardener’s delight, and our Solar Flower garden stakes are no exception! Lilies, roses and tulips galore will fill your backyard garden and entrance walkways with beautiful color and charm and do something none of your other flowers can do – shine and sparkle in the evening! That is correct, beautiful color and design all season long, and no water required! 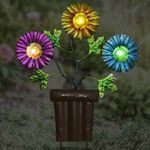 Each of these solar flowers have a discreet solar panel that collects energy from the sun and stores that power in a rechargeable battery. 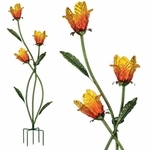 Most flowers get their energy from the sun, and these solar flowers are extra sophisticated. 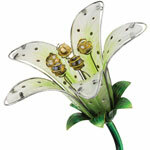 In the evening time, a sensor turns on a bright LED light that helps these flowers illuminate in the evening. 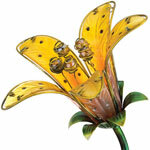 Most of our solar flowers are made of metal and glass for long term durable enjoyment! Are you one of these people that plants flowers every other month and they just seem to die on you? Are your thumbs so far away from green that getting anything to remain green and colorful in your home is next to impossible? 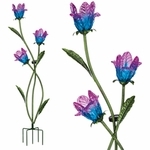 Our flower garden stakes are perfect for everyone who loves flowers and color in their gardens, but they are even better for those who have trouble keeping flowers alive. 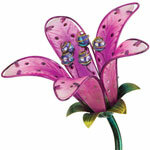 “Beautiful color all season long, no water required!” is the motto we like to use with our flower garden stakes. It doesn’t matter if you remember to water them. It does not matter if they were planted in location that does not receive enough sunshine. The species of flower has no relevance to your altitude of the type of dirt you might have in your garden. 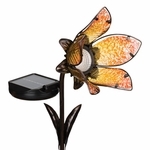 Our flower garden stakes can be enjoyed anywhere you like, even if they planted in a pot, or in a cement or rock filled pathway without any dirt. 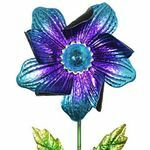 Our solar flowers are extra special because they are beautiful with bright colors during the day, and they light up at night. 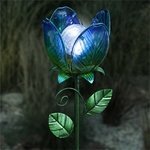 People love solar garden stakes because they provide exciting accents to any home garden. 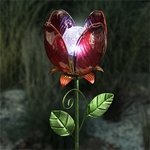 When the lights are low and the evening fills your garden, all the beauty gets veiled in darkness. 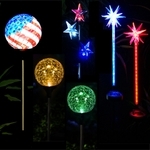 Solar accent lights provide a surprising focal point to look at. It might be a solar animal, it might be a cute solar cottage that draws you closer for further inspection. 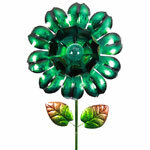 Our solar flowers are really fun because at night is when they truly stand out. 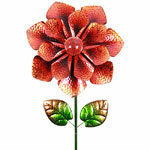 Solar flowers made for great garden gifts for any outdoor enthusiast. 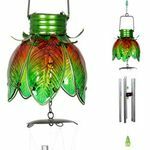 They are incredibly easy to set-up; you just turn the solar panel switch to on and place it in the ground anywhere that looks great. 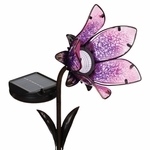 The more sunlight that hits the solar panel during the day, the longer the flowers will stay lit up in the evening. 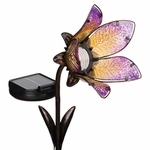 Most solar flowers stay lit 4-5 hours, but we’ve seen many last all night long, especially our upgrade nickel metal-hydride rechargeable batteries. 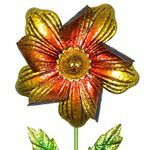 Aside from the Christmas holidays, Mother’s Day is the biggest floral celebration that takes place on our site, and ever since we started selling our Solar Flowers this category has been exploding! Moms have always loved received chocolate and flowers on their special recognition day, however they will complain about the calories in the sweets the next day, and have to throw away most bouquets within a week. 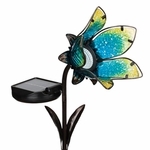 If you need a great gift for mom on Mother’s Day, or any other day of the year, our Solar Flowers will be a big hit and pack a great evening surprise. 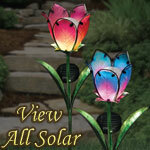 Line a driveway with our Solar Flowers for a wonderful welcoming home stroll!